1. An organization, especially a company, that acts as the agent, representative, or subcontractor of a person or another company. 2. An administrative division of a government or international organization; such as, a United Nations agency. 3. The building or offices where an agency is located. 4. The action, medium, or means by which something is accomplished. 5. A legal relationship involving a person, the principal, and someone else who acts for the person, the agent; or the area of the law concerned with such relationships. A misspelling of the Latin plural form of agendum which is agenda. 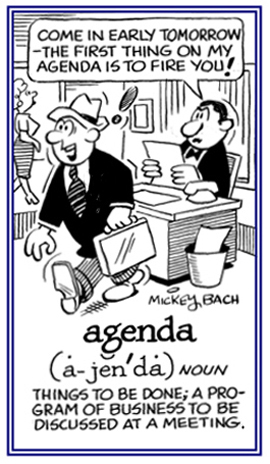 In modern English, agenda is often considered as the singular form with agendas being the plural: The secretary kept track of the agendas of the two executives. 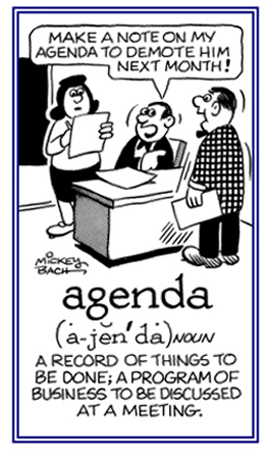 The better informed person will use agenda for the plural and agendum for the singular usage. 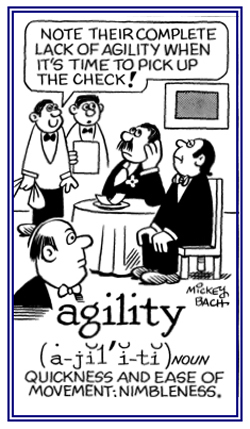 Pertaining to a manner of movement with quickness, briskness, lightness, and ease. 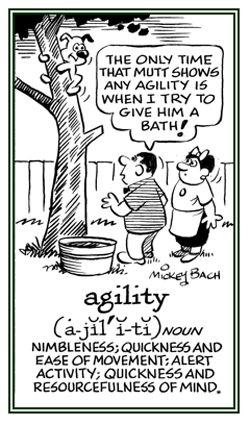 Nimbleness or gracefulness of a person, or animal, that is quick and nimble; that is, fast in movement. Agitato vase, the vial being shaken. A reference to being easily up set or emotionally disturbed. 1. To move violently; to stir up or to shake up. 2. To excite or to disturb the feeling of. Showing page 3 out of 15 pages of 217 main-word entries or main-word-entry groups.